Accessories on this page are not Wayland products. Most are made or sourced from within the UK. Wayland (factory) sourced accessories are listed in Accessories. Anchors - Anchor holders on the fore decks of the Mk I Achilli / Mk II Zoska / Formoza kayaks are designed to hold very small Bruce and folding grapnel type anchors. Weight - approx 1kg. Some folding anchors come with a bag - secure this inside the boat. 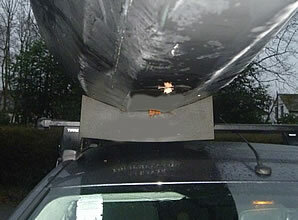 EG use with Harpoon / Amazon as these kayak models do not normally have anchor holders fitted on the front deck. If you are concerned about the anchor potentially accidentally damaging the skin of the kayak, then either a sand anchor or the plastic coated 2 part military anchor is the possible alternative. The sand anchor is a heavy duty tri-laminate bag which you can fill with rocks, stones or sand as needed (up to 14kg). Foam cradles - dual purpose cradles that can be used for car-topping and to keep your kayak / canoe off the ground. Due to the firm open cell foam construction, the cradles will hold your boat without any pressure points. The cradle has a groove on the underside and this groove will fit over the majority of car roof racks and canoe trailer bars, and can be easily removed when not in use - groove is 6cm wide at its widest point. Measures 45 x 15 x 15cm. Sold in pairs. ECKLA 'FOLDY' folding cart (made in Germany) - specially designed for folding kayaks. With large sized pneumatic wheels and sturdy anodized aluminum frame. This multi-purpose FOLDY can be opened up as a 'stack truck' or luggage trolley - to carry packed kayaks, folded as a flat-top cart / dolly - to carry an assembled kayak, and 'flat-packed' - to put away inside or on top of the rear deck of the kayak. A very practical and well made cart. Complete with securing straps and drawstring bag. The FOLDY with the wheels removed is compact enough to fit through the cross-rib behind the seat of any kayak and through the cross-rib at the front of the smallest single seater Harpoon I 450. Otherwise on kayaks with deck lines / D-rings, the cart, can be strapped on the rear deck using the cart's own securing straps. Cross bars has 2 pairs of solid foam padding. Folded as a flat-top kayak cart - Pacific Blue Trojak III +CH. Greenland Anglesey Stick - Specially designed slightly longer than average Greenland paddles to cater for the Waylands and other broad beam kayaks. This traditional Greenland design is an increasingly popular choice for sea-kayakers and is also excellent for long distance touring. The paddle is light, easy to control and can reduce the risk of shoulder injuries as well as being the least tiring design of paddle to use due to the way the paddle is used. This paddle is hand-crafted from carefully selected single lengths of western red cedar, a wood that has been used by indigenous people for centuries. Western red cedar is beautiful timber with a high strength to weight ratio and good resistance to rot and fungus. The Anglesey Stick is finished with Tung nut oil, which is water-resistant and provides a good grip even when wet. The blades are narrow so that they can be gripped anywhere along the length from loom to tip and are designed to be used for a more variable range of uses & techniques. Made to order in the UK, and sent direct to you from the factory, 2 - 3 weeks after order payment. Multi-purpose steering / sighting marine SILVA 70UN / 70UNE compasses. These compasses come with a holder that you can screw onto the wooden Accessory Mounting Board - see Accessories). The compass holder allows for easy removal of the compass itself for quick hand bearings or for packing the compass away when not in use - when mounted in the compass holder, the compass serves as a steering compass. These compasses float! Ideal for wooden framed, large cockpit kayaks. Kayak SILVA 58K compass. These compasses have bungys and hooks - place directly onto the foredeck and clipped onto existing deck lines. Ideal for alu framed small cockpit kayaks. With a built in diode illumination powered by two watch batteries. TNP paddles - "SEA" range - classical sea and touring paddle. These paddles are incredibly tough, of medium weight and yet still affordable and suitable for anyone who takes the rough water with the smooth. The blade material is made of highly tough polyethylene (HDPE). The various shafts do not differ in strength, only in weight. All shafts have approx 30 mm outside diameter. Blade area: 626 cm2. Standard push button couplings with 3 angles. Available to order at 220cm and 240cm lengths - the ideal length to accommodate the broad beam of folding kayaks. 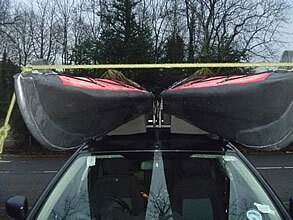 If ordering two paddles for double seater kayaks, it is recommended to purchase one of each length. Seattle Sports Dual-Chamber Paddle Float - an essential tool for self-recovery. This paddle float is designed with an extra large capacity for maximum buoyancy, quick-release buckles for easy attachment to kayak paddles and a clip-on safety tether to eliminate loss in windy conditions. The attached bright yellow float can also double up as a flag. Painters - bow / stern floating mooring rope. Sold in pairs. Black 5m with plain ends, Yellow 4m with plain ends, White 4m with nylon eye. A good buoyancy aid rated to 50Newton class will support a person over 25 kg with a good freeboard but will still require the wearer to be a good swimmer as it will not turn you over into the safe back position. If you require more buoyancy or are a non-swimmer you should look at least a 100 or 150 Newton life jacket (not listed here). Life jackets have buoyancy concentrated to the front and collar and these help a person turn over onto the safe back floating position. A good PFD for kayaks are ones with a shorter cut and do not slide up when you sit down. The sides are also cut away for more freedom of movement. As the name suggests, the Adventure is the ideal buoyancy aid for adventure on the water. If you are fishing, paddling or just looking for a vest with multiple pockets Adventure is an excellent choice. There are two front zip pockets, a large one to use for example, a bait box and a smaller one for a mobile phone. The Adventure also has several attachment points, a holder for pliers or multi-tool and retro reflective patches on the shoulders. The back has also two drain mesh pockets. As these are 50N buoyancy aids, these products are only suitable for competent swimmers. An advanced dinghy and kayak buoyancy aid used by Olympians and world champions. Airex super soft foam in combination with laminated polyethylene foam makes it extremely comfortable to wear. Featuring a Mylar front pocket and a durable all Delrin zip. Waistband with double Velcro closure to prevent riding up, reinforced shoulders and bottom draw tie. High cut for easy hiking and trapezing. As these are 50N buoyancy aids, these products are only suitable for competent swimmers. Mans best friend should be able to enjoy the water as much as he does. We have a range of comfortable pet aids for all sizes of dogs. All of the pet aids feature good buoyant qualities and have lifting straps and a D-ring for the leash. There are 3 different models to choose from - Standard, Mascot, Professional. An advanced dog buoyancy aid suitable for pool exercising, training and rescue. Manufactured from durable fluorescent material with lifting handle and retro-reflective tape. It has wide comfortable webbing fixing straps and D-rings for attaching a front leash or a rear search and rescue line. The jacket also features two zip up pockets one on each side. The jacket also has the secondary function of protecting your dog against the cold, the foam forming an excellent insulating barrier. Mascot is a new model range using a mix between 0420 and 0410 soft buoyant material and dark coloured sides to prevent discoloration. Manufactured from abrasion resistant nylon material this dog life jacket features a lifting handle with glow in the dark retro reflective tape. The quick drying foam lining buoyancy inside the jacket is 10mm thick. It has wide comfortable webbing fixing straps, retro reflective tape, and D ring for attaching a leash. The jacket has the secondary function of protecting your dog against the cold, the foam forming an excellent insulating barrier. Waterproof bags and pouches - OVERBOARD "Keep it dry". All of these products are rated between IPX5 and IPX8 on the Waterproof Rating System (TM). From ultra strong PVC to lightweight nylon. Available in a variety of colours - to enable colour coding of your kit and / or storage positions inside boat. 5 - IPX8 - Waterproof and submersible to depths greater than 6m. Tear-Aid, the indispensable repair patch for outdoor and indoor usage. Tear-Aid is a unique transparent repair patch suitable for repairing tears and holes in practically many types of materials and is extremely strong and very elastic. Tear-Aid is no temporary solution, it is a permanent repair patch which will also serve as a "Master" repair kit for your outdoor and indoor equipment, and can withstand temperatures between -28 and +60 degrees celsius. Type A - Most materials other than vinyl and PVC. Suitable for hypalon, TPU, CSM hulls, canvas decks, nylon sponson sleeves, cordura bags, spray covers / skirts, and sail sheets. 90% immediate adhesive strength, 100% adhesive strength after 1 hour. Type B - Only for vinyl and PVC. EG sponsons. Can be used immediately, 100% adhesive strength after 24 hours. Twist valves for inflation tubes. Tired of the plug retaining cords getting tangled or loosing the air plugs? Change to twist valves! Fits tubes with a 13mm diameter - fits over the outer part of the valve. Also fits 10mm tubes - fitted to the inside portion of the valve. If you have existing air plugs that looks like those in the photos, then the twist valve will fit. Also fits most kayak air buoyancy bags. Sold in pairs. It is recommended that a sealant is used - EG Stormsure. This minimalist downwind spinnaker sail is a self-launching, self-standing pop-up sail specially created for kayaks, canoes. sit-on-tops, paddle boards, and other small watercraft. Based on the similar concept as the flexible pop-out frisbee and small pop-up tents where the internal hoop provides the required shape when open and is twisted to close and flat-packed smaller when not in use. With a very low center of gravity, the WindPaddle is very safe and easy to use, and usually requires no modifications to your boat. Instead, the sail clips quickly and easily to existing deck lines or hardware. Boats without any deck hardware or attachment points can be rigged by running a line around the cockpit coaming and tying two loops on that line to provide anchor points. Weighing 0.37kg or 0.63 kg (depending on model), the WindPaddle stows flat on the deck in a small folded coil 1/8th its deployed size. When needed, the sail can be deployed in seconds whilst on the move by releasing the hooped strap or a deck bungy. A continuous sheet (steering line) allows the paddler to control the sail whilst keeping the paddle in their hands for balance and steering. Should a strong wind suddenly blow up, all that is needed is to release the steering line a bit to spill excess wind or to allow the sail to fall flat onto the top of the foredeck. The sail can be folded away easily whilst still in the water. There is a large horizontally oriented window for good visibility. The sail rig is also constructed in such a way that it can be turned to sail between 75 - 90 degrees off downwind. The WindPaddle cloth is 1/2 oz. rip-stop polyester, the same material that yacht racing spinnakers use. This material is low-stretch fabric that will not absorb water or become heavy when wet. The flexible perimeter batten is made of a proprietary material that will not rust, corrode nor break unless seriously abused. The window is of lightweight clear vinyl. All of the seams are sail-taped and sewn using traditional triple-stitch zigzag sail seam construction. A triple-stitch zigzag results in a strong seam where the panels are sewn. "Entry-level" sail intended for the recreational solo kayak paddler. The Scout is the same size sail as the Adventure sail, but with a lighter batten and intended for 4-15 knot wind conditions. Intended for the serious solo sea-kayaker. This is the sail for expeditions on big water and will be pulling hard long after you are ready to head to shore. The “Adventure” will withstand any condition you throw at it. The sturdy and unbreakable "expedition-grade" perimeter batten maintains sail shape in high winds and allows for high sailing angles. The largest-sized sail, with a 50% larger sail area compared to the Adventure. The sail cranks the power up a few notches for the heavier boats such as double / triple seater kayaks and canoes or where more power is needed. Target boat – Solo recreational boat to touring kayak, SOT 8 – 15 feet. Off-wind sailing envelope – approx. 180 degrees. GASSP220 Greenland Anglesey Stick, Small Special, 1 piece / 220cms. A shorter paddle with a thinner loom and a narrower blade. Greenland Anglesey Stick, Medium Special, 1 piece / 228cms. Suitable for the average height paddler. GASLS235 Greenland Anglesey Stick, Large Special, 1 piece / 235cms. Longer paddle with a thicker loom.